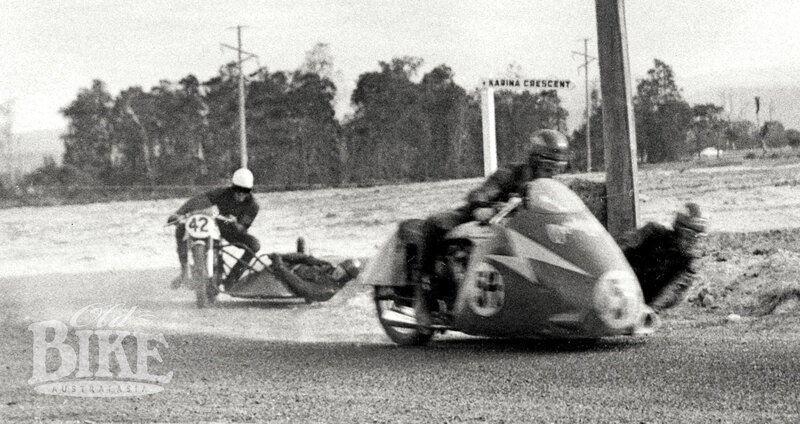 Orrie Salter leads Tony Edwards in the Junior Sidecar GP, through the left hand bend on Karina Crescent, Florida Gardens Estate, Surfers Paradise QLD. The most remarkable thing about the 1959 Australian Grand Prix, held on Sunday July 26 at the partly-finished Florida Gardens Estate residential development at what is now part of Broadbeach Waters in the heart of Surfers Paradise, is that it took place at all. 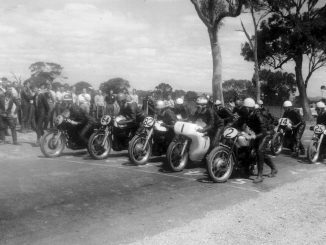 The Australian Grand Prix, in motorcycling terms, had always played second fiddle to the Australian TT, which was endorsed as the official national championship. 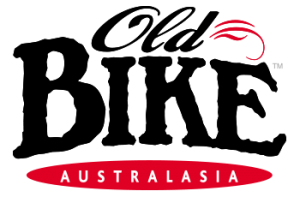 The Grand Prix was not even contested for many years in the ‘fifties, as the controlling body, the Auto Cycle Council of Australia (ACCA) failed to find a promoter willing to stage the event. It was revived in 1957 and run quite successfully at the Bandiana Army Camp on the NSW/Victoria border, but lapsed again for 1958 and would have done so in 1959 had it not been for the ACCA allocating the Grand Prix to the Auto Cycle Union of Queensland in recognition of that state’s Centenary Year celebrations. There was just one problem; where to hold it. 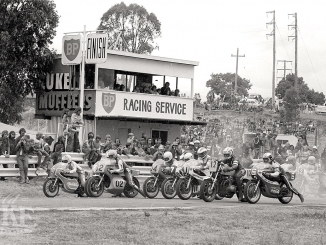 Queensland at the time had no purpose-built road racing circuit, and only the occasional use of the Lowood airfield circuit, where it was always shared with car racing, meaning only a handful of motorcycle races could be accommodated on the programme. In this period, the Gold Coast area was undergoing its transformation from a tranquil swamp into a tourist mecca, and one of the first residential developments was taking place in Surfers Paradise. The grandly titled Florida Gardens Estate was one of the first such local developments to feature canals, and had been approved in 1956. 200 acres of reclaimed marshland, immediately to the west of Cascade Gardens at the junction of Little Tallebudgera Creek and the Nerang River, had previously been a dairy property owned by a Mr Platell of Merrimac. Florida Gardens Estate was the biggest land development in the whole of Queensland and included 1,000 residential blocks and parkland areas. Blocks could be had from around £200 ($400). The sand pumping to raise the height of the land reportedly cost £178,000, and was used to elevate the low-lying land into prime real estate. To mark the completion of stage one of the project, a bridge was opened to connect the development with the Pacific (Gold Coast) Highway on Monaco Street over the creek. A 30-metre canal linked the Nerang River to the creek, giving residents with canal frontage access to the open sea via the river. Just what transpired to identify this construction zone as the site for the Australian Grand Prix is not known, but it was announced that the meeting would be co-promoted by the Auto Cycle Union of Queensland, and the Southport Rotary Youth Centre Committee, who would be the beneficiary of any proceeds. 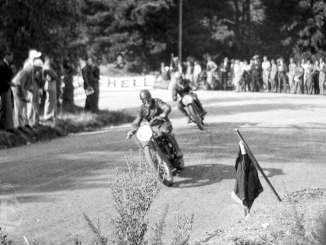 Nearby Southport already had form when it came to motorcycle racing, having hosted the Australian TT around a very fast 5.7 mile public roads circuit in 1955, where the Rotary Club was also involved in the promotion. However the proposed layout at Florida Gardens could not have been more different to Southport, being just over one mile in length and consisting of mainly low speed corners joined by very short straights….. (for the full story and pictures you can purchase back copies of Old Bike Australasia Issue 70 by clicking the link below). This article first appeared in Old Bike Australasia Issue 70.